Our next Saturday event on April 13th takes us ‘on the road’ to Square Chapel Arts Centre in Halifax. 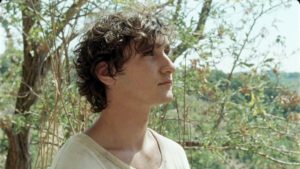 We will take advantage of Square Chapel’s screening programme to offer you an Introduction to Italian Cinema and a full screening of Alice Rohrwacher’s new film Happy as Lazzaro. Alice Rohrwacher’s previous film The Wonders was warmly received when we showed it at Kala Sangam a few years ago and this new film shared the Scriptwriting Prize at Cannes in 2018. It’s a truly magical film that is strongly recommended and our Introductory session will help you to get the most from it by exploring how it draws on the history of Italian Cinema. The usual ticket prices of £18 and £12 concessions apply for this event (and include the price of the screening) but the timings are slightly different. The event runs from 11.00 am to 5pm with one hour for lunch at 1pm. The screening is at 2pm as part of the public screening programme. Square Chapel is very close to Halifax Railway Station and not far from the Bus Station. There are several car parks not far away. Please note: You must book your tickets for the event direct from the Square Chapel website, using the link below.